Iron-sulfur cluster assembly 1 (ISCA1) is one of the essential proteins operating in the mitochondrial iron-sulfur (Fe-S) cluster biogenesis pathway. 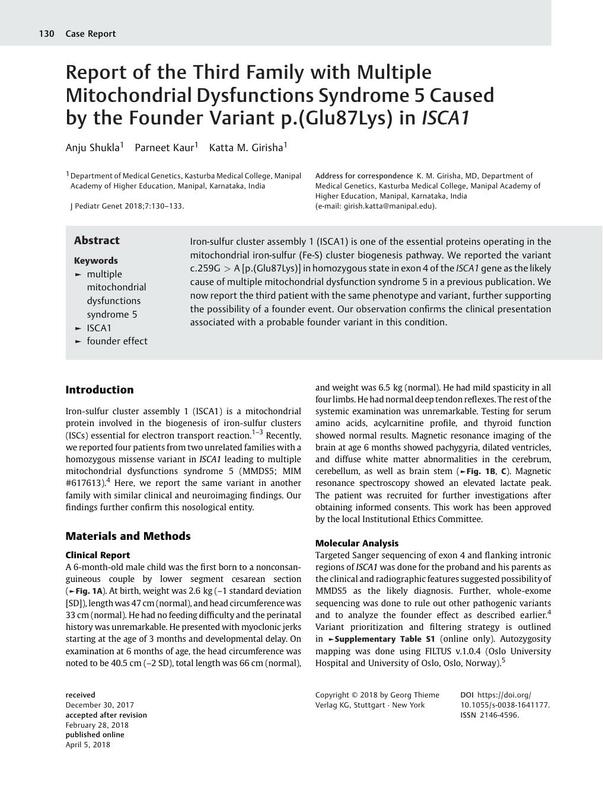 We reported the variant c.259G > A [p.(Glu87Lys)] in homozygous state in exon 4 of the ISCA1 gene as the likely cause of multiple mitochondrial dysfunction syndrome 5 in a previous publication. We now report the third patient with the same phenotype and variant, further supporting the possibility of a founder event. Our observation confirms the clinical presentation associated with a probable founder variant in this condition.